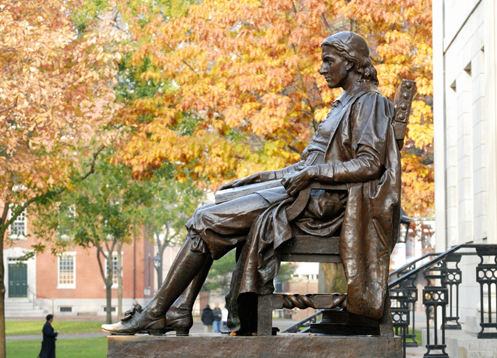 John Harvard statue at Harvard University. Copyright Harvard University. I’m a fourth year undergraduate from the University of Southampton, UK, studying for my masters at the Harvard-Smithsonian Centre for Astrophysics. With my summer reading completed, and a new exoplanet waiting to be discovered, I stepped off the plane into Boston Logan Int. this September and eagerly exchanged a drizzly English summer for a beautiful New English Autumn. So far my education has been heavily exam based with little hands-on research, so this is my opportunity to see what an astronomy career might be like. It is my ambition to write a thesis on the characterisation of an exoplanet – one chosen from the ever-increasing pool of candidates flagged by the Kepler mission. This is a daunting prospect for me: a lowly undergrad with little to no prior research experience suddenly in astronomy heavy-weight territory. Kepler data is highly coveted for a reason – some of the most breathtaking recent discoveries in astronomy have come from Kepler, the spacecraft trailing the Earth in its orbit as it monitors one portion of the sky (just near the constellation Cygnus), continuously looking for the tell-tale blink of a star as a planet passes in front of it. Any of us brought up on a diet of science fiction has to get excited about ‘Tatooine’, aka Kepler 16b, the circumbinary planet. You may have also heard about Kepler 11 – the multiple planet system, or Kepler 19, a star with one transiting planet and one mysterious ‘invisible’ planet. I can’t think of a more romantic area of astronomy to be involved in right now; where else can you use words like ‘Super-Earths’ and ‘Hot Jupiters‘ every day, outside of a comic book? It’s the first day of my first year of research; I walk into my office clutching calculator, pen, notebook, mug, and sit down opposite ‘Unity’, my computer. I get straight to work on a Unix tutorial, slowly familiarising myself with the language of Linux and the ‘command line’. After an initial period of struggle wherein I always forget the difference between ‘.’ and ‘..’, and have a near accident with the ‘rm’ command, I quickly pick up the basics. Aims for the future: think of more descriptive filenames (if only I could remember the difference between ‘test_58’ and ‘test_59’). The next few days see me patiently ‘command-line prompt’, ‘command’, ‘carriage return’ my way through ‘IDL‘, ‘Python‘, ‘Supermongo‘ tutorials. Although I find it satisfying to learn new tools it is a slow process and it stops me racing ahead to publish my first scientific breakthrough. But after a month of ‘cd’ing between directories, running IDL scripts again and again, cajoling Unity into compliance, I sit with her as she finally, reluctantly shows me what I want: spectra. It’s taken us a long time to get here – now it’s time to do science. I’ve spent the last few weeks juggling with data – strings of numbers reduced and processed and compiled, for looped, while looped, zipped and unzipped until they arrange themselves in meaningful patterns and I’m looking at something that no other human being in history has ever seen. This is what science is about – the bunch of dots on my screen that hold so much information to the well-trained eye, a few wiggles here and there which make all the difference between breakthrough and null result. I look forward to the day when those dots and wiggles show me my first planet. One day they may even be able to say ‘rocky planet in the habitable zone’ and eventually they’ll say ‘rocky planet in the habitable zone with an O2 atmosphere’. Maybe by that time I’ll have finished the online tutorials. This post was written by a guest author. If you're interested in writing a guest post for Astrobites, please contact us. Loved this post, Ruth … such a beautiful (and oh-so-accurate) description of the start-up process! Most beautiful astrobite post I’ve read yet. I hope you continue to submit posts for this site. Cheers and happy researching.